Simple Direct Non Classical approach to functional street self defense. You will NEVER question the effectiveness of your training again. John hosting the Annual Jeet Kune Do Event with Tommy Carruthers from 2013 - 2017. In 2017, John was officially recognised by Tommy Carruthers as the First Apprentice Instructor in South East Asia. Check out the seminar highlights. Low crime doesn't mean no crime. Most of us think of Singapore as a very safe country, only because trouble has not crossed our path. Here are four cases of horrific attacks that no one would have expected to happen in our country. A money changer was going about his daily routine when he was attacked by a knife-wielding robber.He was bleeding profusely from multiple slash wounds. During a late night supper, a man was confronted by a love rival and had his nose sliced off in the attack. On her way home from work, this lady was robbed and sustained stab wounds to her lungs, liver and thighs. This taxi driver was attacked by two fare cheats resulting in deep cuts and head injuries. Discover how your body can be trained to be a functional self defense weapon. Extra emphasis on accuracy trains us to end all fights with the least number of hits. Be Aware. Learn to think and adapt to any dangerous situation in order to stay unhurt. We step out of our comfort zone to test if our techniques can work under stressful conditions. Train for Survival or for a Fair Fight? I have met a lot of people that wish to learn to fight in a dignified and fair manner. We keep forgetting that we should be learning to protect ourselves against animals. How do you train for Knife Defense? The advice has always been to run whenever you can, equalize with a convenient tool or, be prepared to be stabbed and sliced, and trade the hell out of it. The 3 squares represent the 3 stages of cultivation Bruce Lee felt that all martial artists will go through. Is this JKD? Is that JKD? 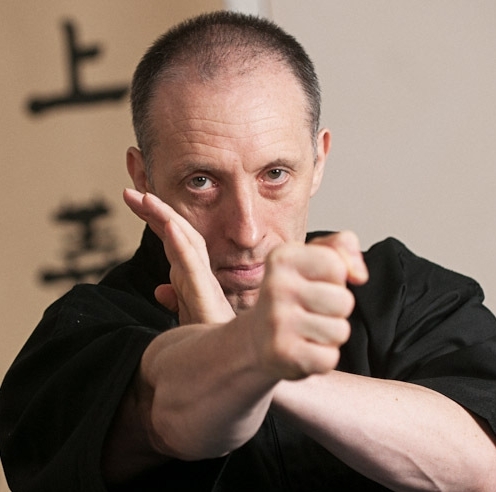 Read about John's advise to students who are seeking to learn JKD.